Illustration from the book where William Herschel discovers the planet, Uranus, “The Tales of Astro Cat”, Chapter, “The Herschels”. 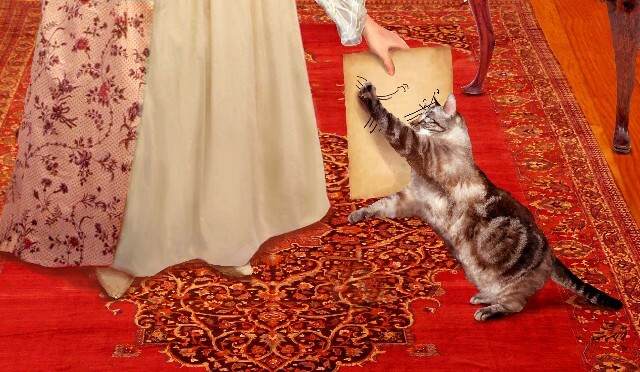 Excerpt from the chapter where Jovianna (Astro Cat), beloved cat of the Herschels assists in the discovery of Uranus: “Ask her, then.” said William. “While I personally might give some weight to her opinion, I’m not sure if the astronomers of Europe would be convinced.” Caroline turned to Jovianna and asked, “So, what do you think, Liebchen, comet or planet?”. The cat bounded over to an empty wax tablet and made some scratch marks. “Planet, says the cat! William, you have discovered the seventh planet! Why won’t you just admit it?” William replied, “I will be the last to declare it a planet. After consensus has been reached I will say so. But,” he added, “I’ve got priority!” He grinned widely and gave a quick wink to Jovianna. “The Tales of Astro Cat”, copyright 2012.